1. We bring crayons and papers! I reused a plastic box after emptying a bunch of dental flosses, to house their crayons. Clipped some pieces of quartered cut papers and carry along, for doodles. 2. 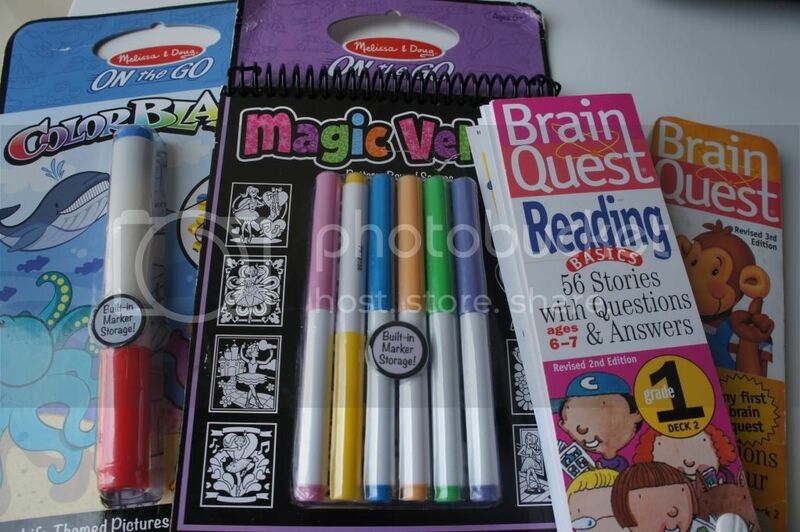 Also for doodling and writing. 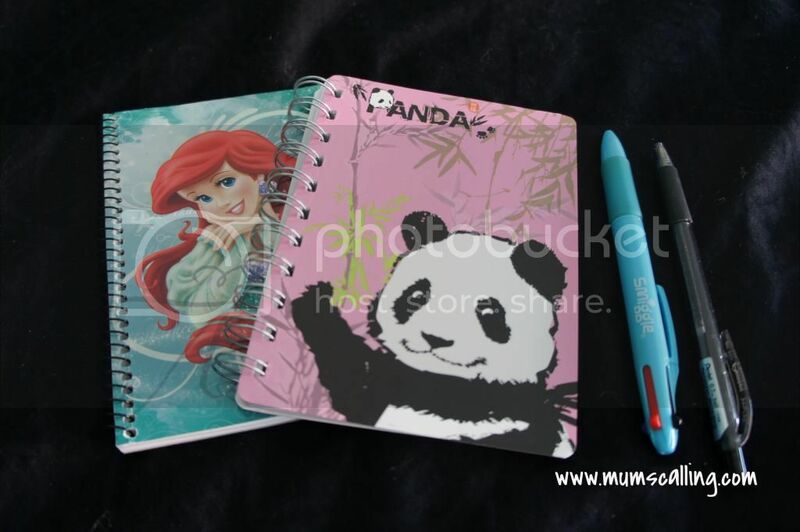 Notepads and pens! Interesting to see what birthed on the first and grew to the last page. 3. Small and light weighted books! Jazz loves reading and Jare loves flipping through illustrations. Rotate the titles, so they don't get tiresome of the repeats. 4. Small little travel activities which we are much in love with and easy to carry around. 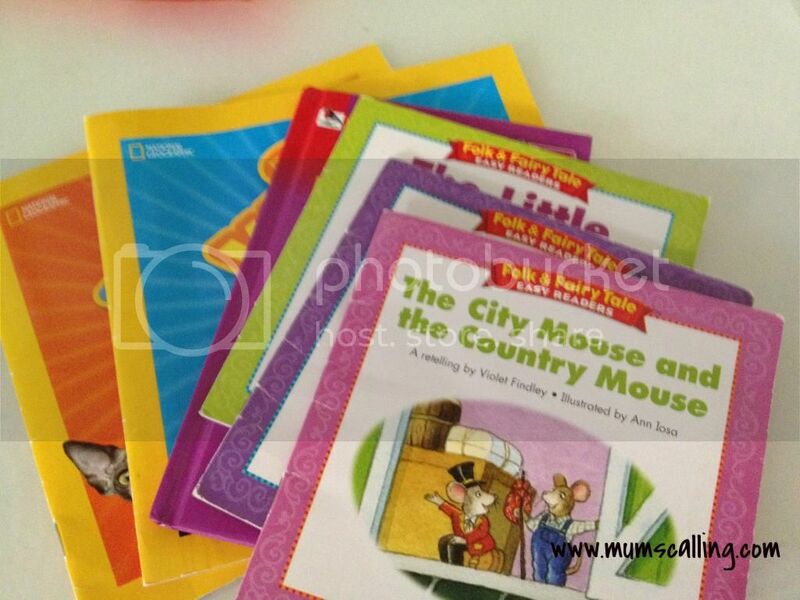 We got them in the states, but I guess they can be easily purchased on Amazon, local toy or book stores. 5. And if all else fail, tablets and smart phones always work perfect for mine. Positively, there are plenty of educational apps that you may download for them to point and drag. It's limited time they can engage from starting a game to the arrival of dishes. Pretty much controlled. I love it when they engage in their own little activity in a restaurant, while I look through the menu almost uninterrupted. So yeap, no more diapers and milk bottles in my bag, but with such little gadgets almost permanently residing in. 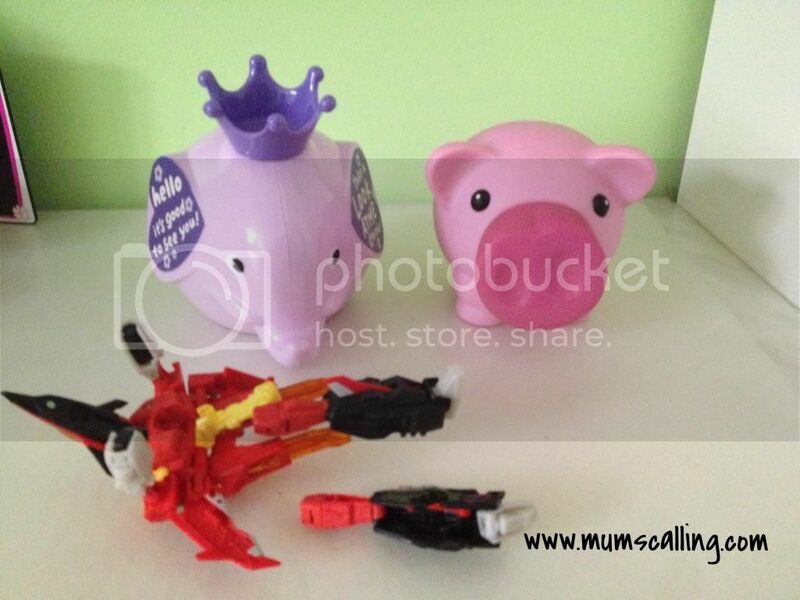 However, on good days, such stuffs get into the kids' carry out bags, with their own responsibility throughout. It's definitely some weight lifted off mine. Here are some DIY portable ideas A Pancake Princess does for her boys. Let me know too, if you have ideas on keeping little butts down when eating out or in need of their patience. 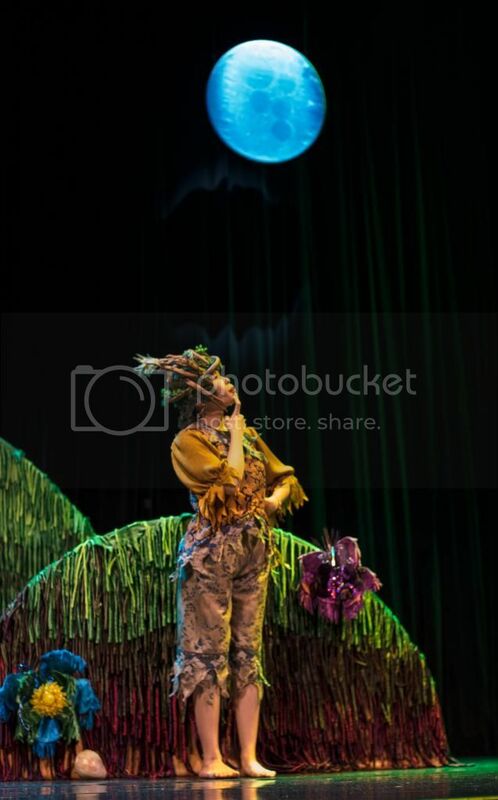 Just yesterday, we caught the theatrical show Round the moon Blue the sky. 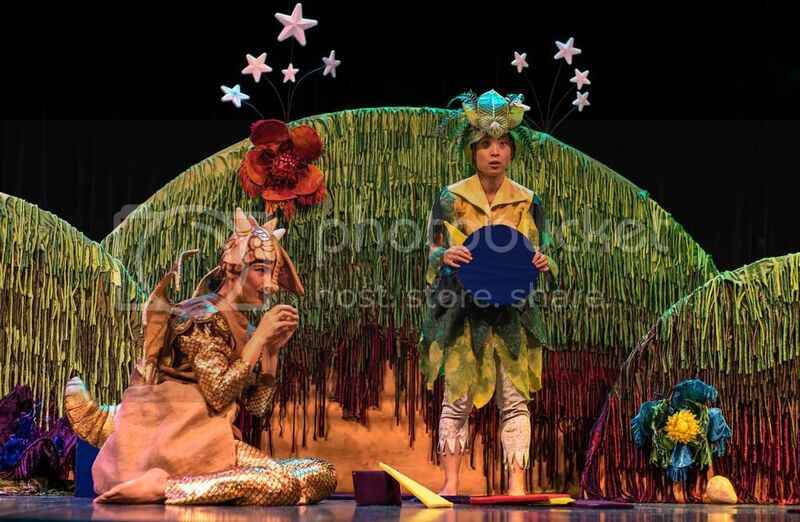 A theatre play where we journeyed with smallest dragon's ever curious questions on Why, How and What? She pokes her nose into things and is curious about the world. One night she sees the moon, and wonders why it is the shape that is. Fascinated, she sets off to find other round things, discovering the many other important shapes too. As she explores new things with her friends, Leaf and Twiglet, she also discovers the wonder of colours! It's all about exploring and discovering my little ones, not Mummy or Daddy for answers! The show not only engaged black light magic, which showed beautiful props when lights were off, it was also highly interactive. Little audiences were really responsive to their questions. There was a moment when they asked for 2 audience volunteers to explore shapes with them, creating something out of shapes. Under my Mum's pressure, Jazz went forward to volunteer. OMG! When did she become this courageous?!! It was a memorable sight to watch her in limelight for a while. The characters demonstrated how they convinced their friend on the many other round things around them, like bubbles. Not just the moon. They showed that leaf isn't always green, fallen leaves are brown and that there are many more blue things, not just the sky. It definitely moved little minds into the mode of thinking. The whole show was played with very little actual conversations between the characters, only important key words or sentences were spoken. It's a joint collaboration between, Hong Kong, Japan and Singapore artists. So yeap, that explained the different foreign accents heard. In addition to the focus given on shapes and colours, the show might be a little slow playing. Which I thought might be better for the really little ones, maybe below six. The show lasted about 45 minutes and Jare didn't get enough of it, he asked for more! Jazz on the other hand, left contented and happy. I bet they learned and gained something out of the show. They yakked non-stop about it during our journey to lunch and till home. Gosh, spare my ears! There are more plays upcoming by itheatre, which we are all excitedly looking forward to. 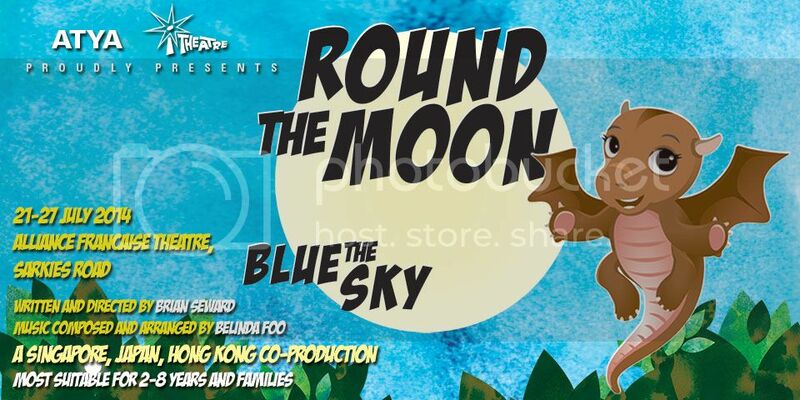 For only this week, Round The Moon Blue the sky is showing at The Alliance Francaise theatre from 21st to 27th July 2014. Don't miss your chance to purchase tickets at sistic. Disclaimers: We had the opportunity to catch this play with sponsored tickets by itheatre. All opinions are solely our own. Many new attractions have budded during the time we were away. It's exciting to be back in homeland with many new family friendly places to visit. Trying to conquer as many as we can. 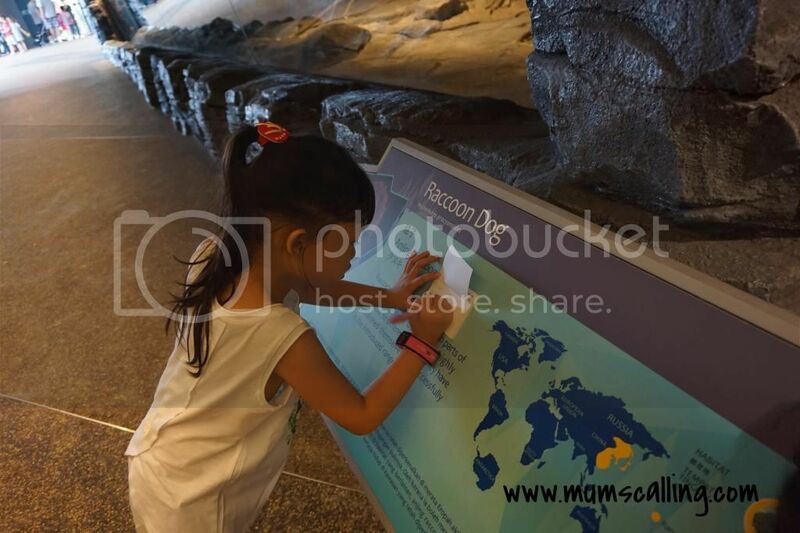 We have recently visited the Far East Organization Children's Garden at Gardens by the bay. An outdoor play area that combines both play and nature. As outdoor suggests, the best time to enjoy that tan, would be early morning or late evening, when our lovely sun isn't that blazing. 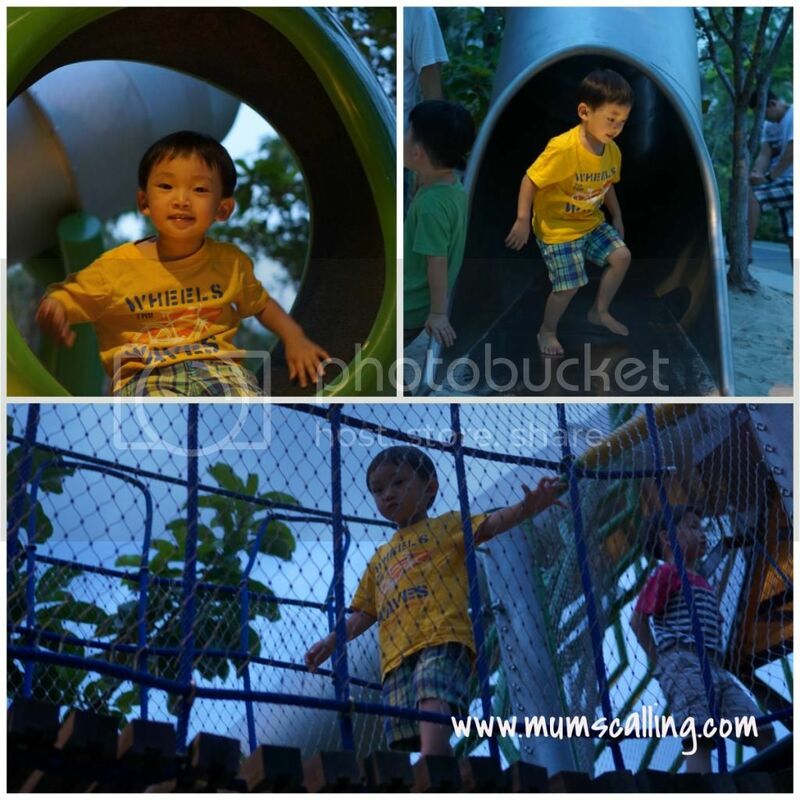 The children's garden consists of both water playground and sandy adventure playground. It's probably wiser to sweat it out at the dry playground, before cooling off at the water ground, followed by a clean shower. Oh, so cooling! Most attractive of all is that, admission is free. 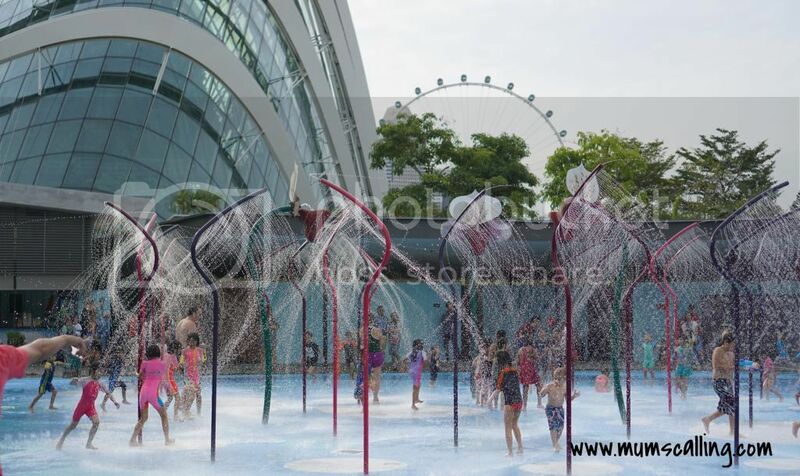 It consists of 2 areas, the smaller one for little toddlers and the other bigger one for older kids, where more craziness and running take place. 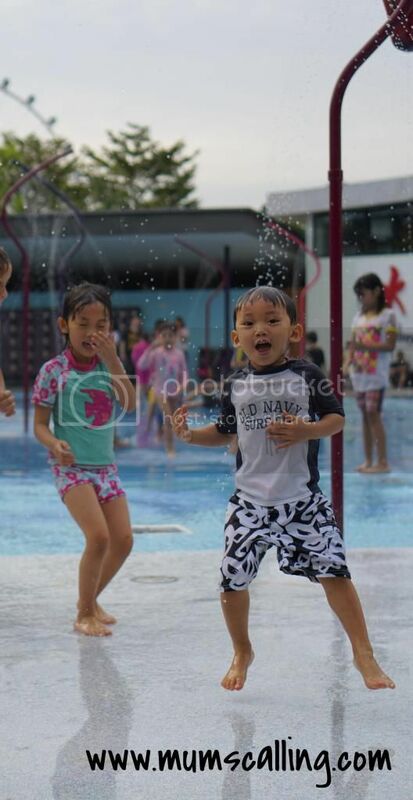 The water play features aren't exactly exciting or fanciful, but good enough to ignite simple little joy. It was nothing more than water sprouting and spraying. Jare had tremendous fun though, almost like playing in the rain. Jazz, after playing awhile, came to me and said it was boring. "No slides", she said. Her perception changed totally when her bestie arrived to join her for play. Companionship makes a difference! There were some safety personnel on duty to ensure safe play. There's also locker and shower facilities. Everyone can join in the fun! A jungle liked adventure within canopy of trees. There are tall tree house and little trails to explore. Other play features include a spider net, hill climbing ropes and spinner bowls. Lots of climbing and some strategy planning to clear their play obstacles. This whole area kept them entertained, and it was almost difficult to recall the kids for dinner. Definitely a good place to expel their energy, and good plan for parents to shove them to bed early. The last part was my highlight! Food spread and wonderful company excites me. We had dinner at Satay by the bay, a very short walk from the children's garden. 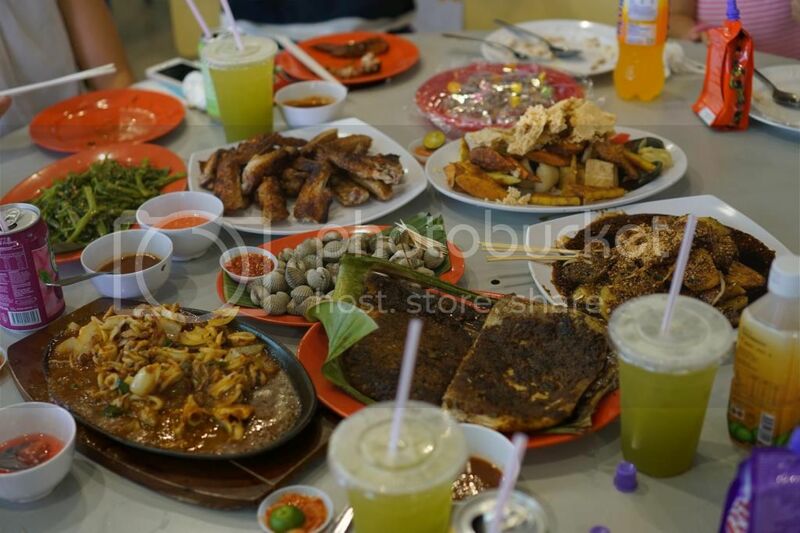 It's a hawker like place with a great variety of local delicacies to choose from - BBQ chicken wings, chicken rice, popiah, ngoh hiong, BBQ seafood selection, steamboat and of course, satay! Truth to be shared, the food was only passable. Not very tasty for most, only convincingly impressed with their satay. Living up to the name of the place indeed. Our friend ordered it from the Geylang satay stall, which came really juicy and tender. The sauce to go with was great too. So delicious that the kids wolfed most of them down. Our BBQ seafood was ordered from Boon Tat seafood, which was near to being terrible. When it comes to food, my thoughts are, not only should we try to make the money paid worth, but also the calories worth. Metabolism is slowing down on me. It was extremely crowded on the day we visited, a Saturday evening. And so, it means some strategy and courage to get seats. Our unique hawker style. And of course, if local delicacies isn't your craving that day, there are other restaurants nearby for your tummies to explore. If you crave for local delicacies, I would think the best place that presents it all is East Coast Lagoon Food Village. Though also challenged by the humidity and seats, we thought the devouring of delicious food covers that multitude of challenges. Need to be back there soon! As for this bay, maybe once in a blue moon. *Closed on Tuesday if a public holiday falls on the preceding Monday. Some weeks ago, yeap, I'm turning time back a little, Jazz and her besties, signed up to ambitiously be a "Doctor for a day!" We were glad that it came back! It ran the Orthopaedic edition at Parkway East Hospital this round. Where little participants role played as Orthopaedic doctors, did bone surgery and knee bandages. In line with their special edition, each child's registration fee of $25 was matched with $300 by the hospital, to sponsor knee replacement surgery for the needy elderly. It was sure great fun for little ones and worthy cause for the elderly! It was an approximately 90 minutes session with several stations to cover. Little doctors embarked on an educational journey in the different settings-like departments, Operating Theatre, Nursing room, Accident and emergency, General practitioner and Pharmacy. At each room, facilitators would share some medical knowledge and talk about the doctors' scopes. Little doctors got to role play with their fellow doctors, worked with thermometer, stethoscope and operating tools. They learned to handle cuts, wounds and bandage too! And Jazz's favourite was also the happiest room of all, the nursing room! Where they got to care for newborns baby dolls, changed diaper, fed and sang them a tune. I'm pretty sure doctors don't do these, it was probably more for parents to decide if they're ready to help out with a new addition. A group photo was taken with their fellow doctors, and given to them as a lovely memento. They moved into the last room, which was the pharmacy, to collect their dose of medicine goodie bag! At the end of their educational journey, they graduated and were certified as, "Doctor for a day." They are however, now back to their young profession as adorable preschoolers. You know the verdict when Jazz says, "I want to come back, to be a doctor again!" Que sara sara, whatever will be, will be... I hope you are aspiring to be a genuine one, my darling! 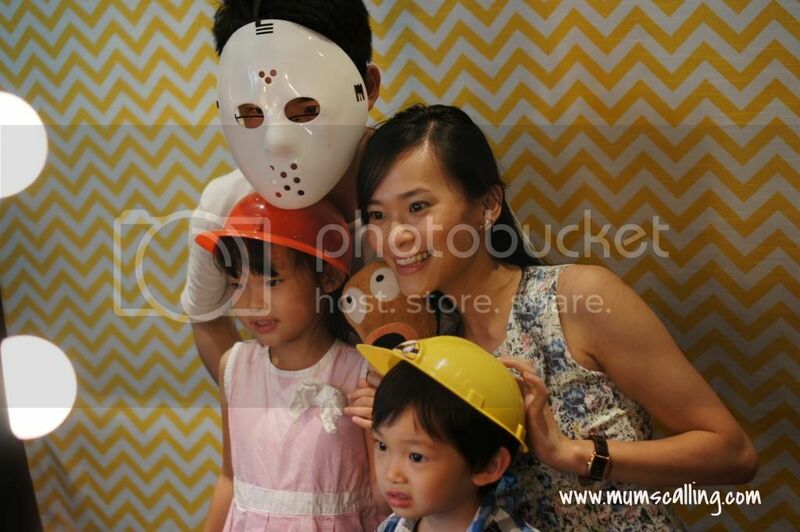 This event was catered for children between 5 to 12 years old. Parents were not allowed in the rooms, so we were like paparazzi, snapping pictures through the opened door. Jare being 3, was in the man's custody. He had balloon twisting fun at the lobby, where some pre-event activities were held. It was an overall good experience for the little ones, to affirm their dreams and inspire their thoughts! Not sure when they might run this event again, but seats fill up really fast. You may want to follow their Facebook - PEH for updates. While parents ended up doing a short survey about Parkway East hospital, which they were trying to promote itself for more awareness, I was reminded of my wonderful experience with them during my dengue infected stay. Aside from the discomfort of being unwell, my stay was almost like a vacation. Oh no, I'm not saying it was the being away from kids. I was well taken care by the angel nurses, well fed and well entertained (HBO!). I highly recommend this hospital. And nope, I wouldn't want to be back there for any unfortunate reasons. Just sharing an experience. We've been to the local Zoo multiple times, and I thought we knew the place pretty well. Recent trip gave us some interesting finds on the attractions and activities. 1. We didn't know we could feed the rhineceros! 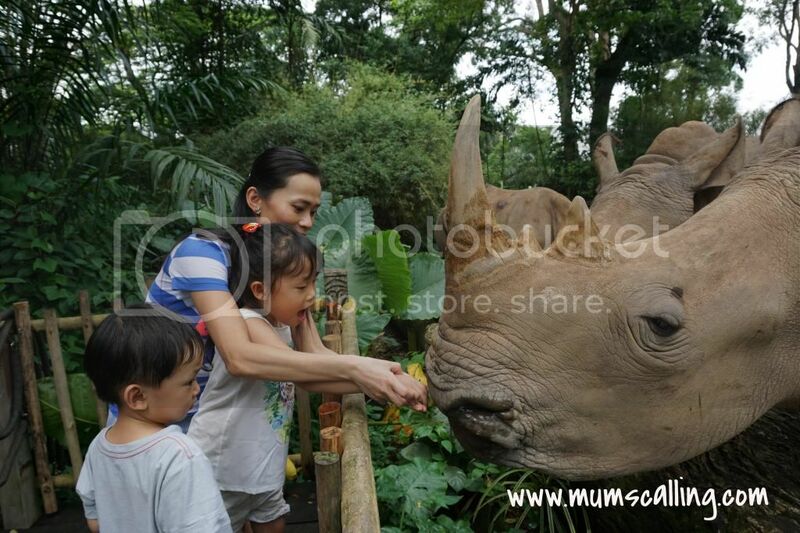 I knew about feeding giraffes, but not the rhinos. This got the kids, and myself really thrilled! I didn't think we could get so safely close to them. 2. The Frozen Tundra is opened! An icy cave built up for our polar bear, Inuka. Whom we found out, he's the World's first polar bear to be birthed in the tropics. How amazing our zoo is! This cave is perfect hide out from the sunny day heat. It's an arctic experience in there. 3. We could make learning out of excursion. Jazz brought a note pad and pen to write the names of all the animals we visited. Next trip, we could bring our drawing pad to sketch some live animals. Did you already know about them? Let us know of any other interesting finds in our Zoo. It definitely is a place of endless fun and discoveries. Plan in your next visit! 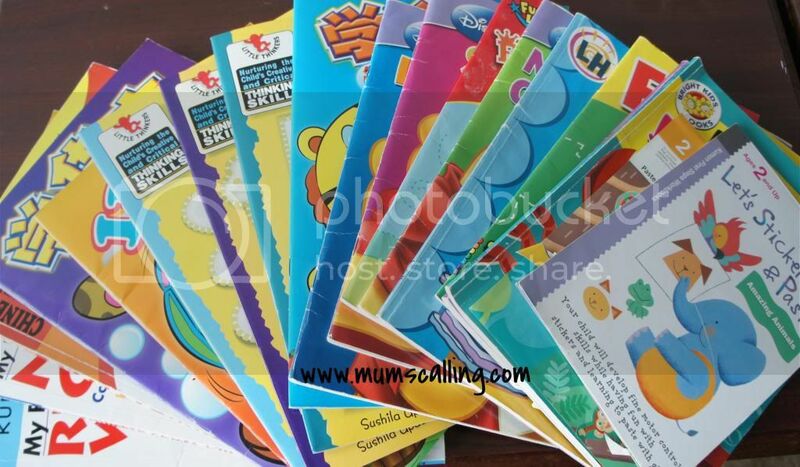 Most parents are extremely concern about straining our kids' eyes when they get on books or TV, and not much focus is given to those little eyes when we're out in the sun. In fact, we are often expose to ultraviolet radiation from the sun, whether sunny or cloudy. Our eye structure can be damaged if too much UV ray is absorbed. It's worth some thoughts about taking care of those eyes not just indoor, but outdoor too. 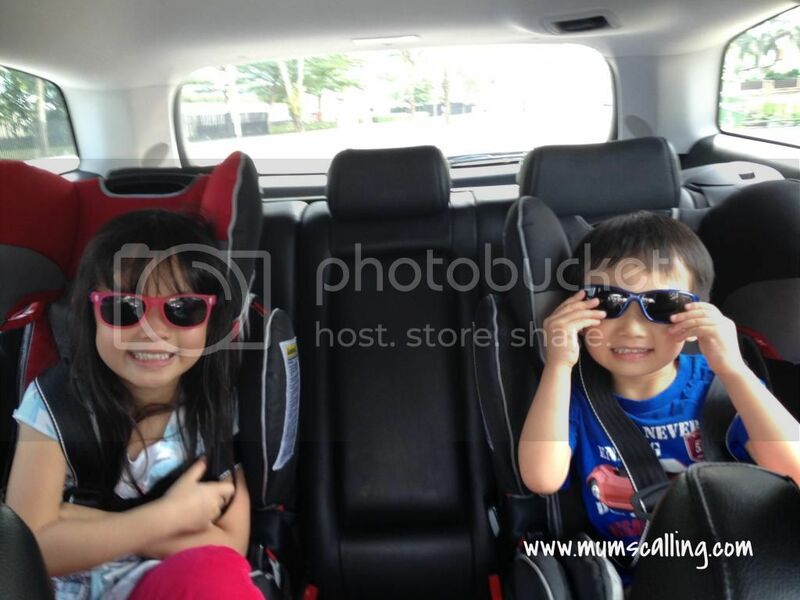 Our family uses the sunglasses whenever we are out in the sun for a prolonged period or during long road trips. Even more true when we were in California, where the sun rays were much more piercing. It kind of cultivated our habit of putting on sunglasses, which was very much a necessity than just an accessory. It was a need to look cool. We are excited that the kind people from Safilo had sent us 2 pairs of Polaroid sunglasses for little Js. Js chose their preferred design, and are very much in love with their colourful choices. At times, Js find sunglasses a little cumbersome for their outdoor play, and they would remove it after some time. They are however convinced, to at least put it on during our car journeys, where they are confined to their car seats with almost no room to avoid the sunny and harmful rays. This is specially true when the sun greets them almost face to face, at different timings of the day. Or depending on the direction our car is moving in, it can be sometimes be difficult to avoid the sun. Drivers get their eyes protected, so should little passengers. Those sunglasses are even more handy when Js doze off in the car. Those shades are saviour to their eyes, giving them comfortable rest from the bright. Trendy and stylish with contrasting colours. Durability. Jare loves doing spectacle splits, and it withstands his handling. 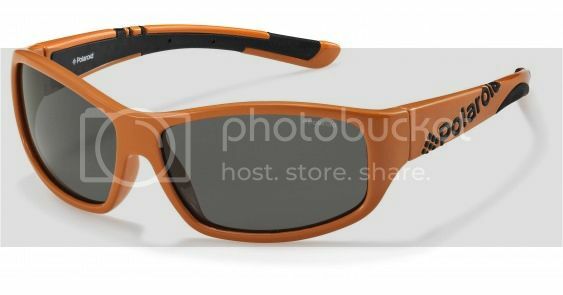 Made with allergy-free materials, with top quality Polaroid polarized lenses. Superior optics give clear and true vision with no shape-shifting side effects. Thereby leads to less eye fatigue. UltraSight™ lenses are made of several functional elements. The core element is the polarizing light filter. UV light absorbers are bonded to both sides of it. Shock-absorbing layers are then fused to both sides of the UV absorbers, making the lens light, flexible and impact resistant. A scratch-resistant layer on both the outer surfaces completes the lens structure. Perfect! Now that I write about it, I do think investing in a good and sturdy pair of sunglasses makes good economic sense in the long run. Especially when you know comfort and durability isn't compromised. Polaroid kids are available at better vision outlets, paris miki outlets and major retail eyewear stores. 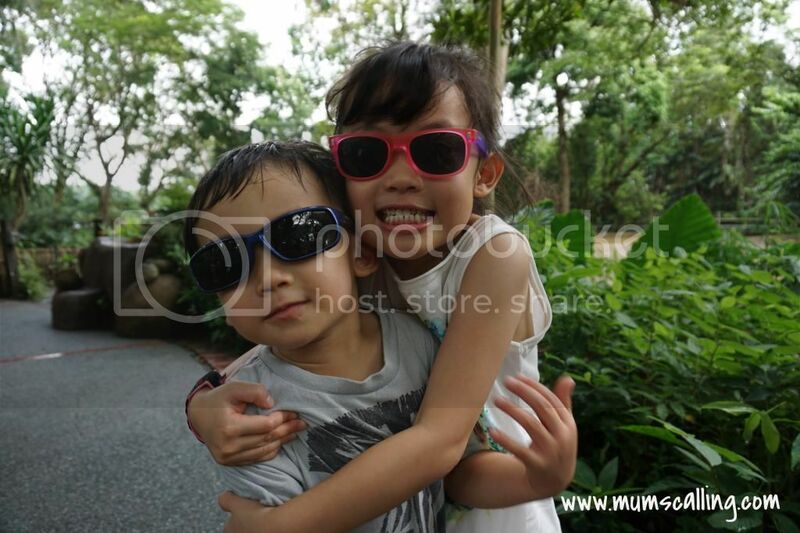 A great piece of news is that Safilo is also giving away the following pair of polaroid kids' sunglasses (Retailing $60), for readers of Mum's Calling! 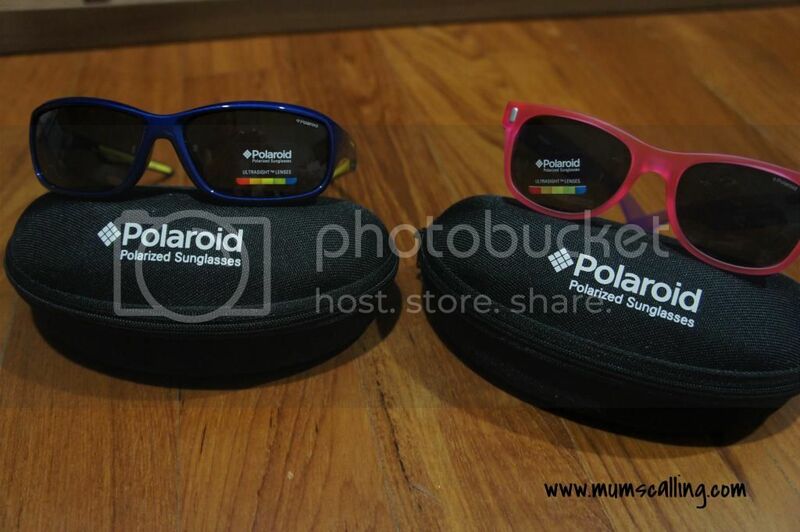 Disclaimer: We were given 2 pairs of Polaroid kids sunglasses for review, no monetary compensation was given. All opinions and photos, unless credited, are solely ours. Some weeks ago, we had the opportunity to attend a dinner party hosted by Intercontinental hotel, for the roll out of its Planet Trekkers menu. 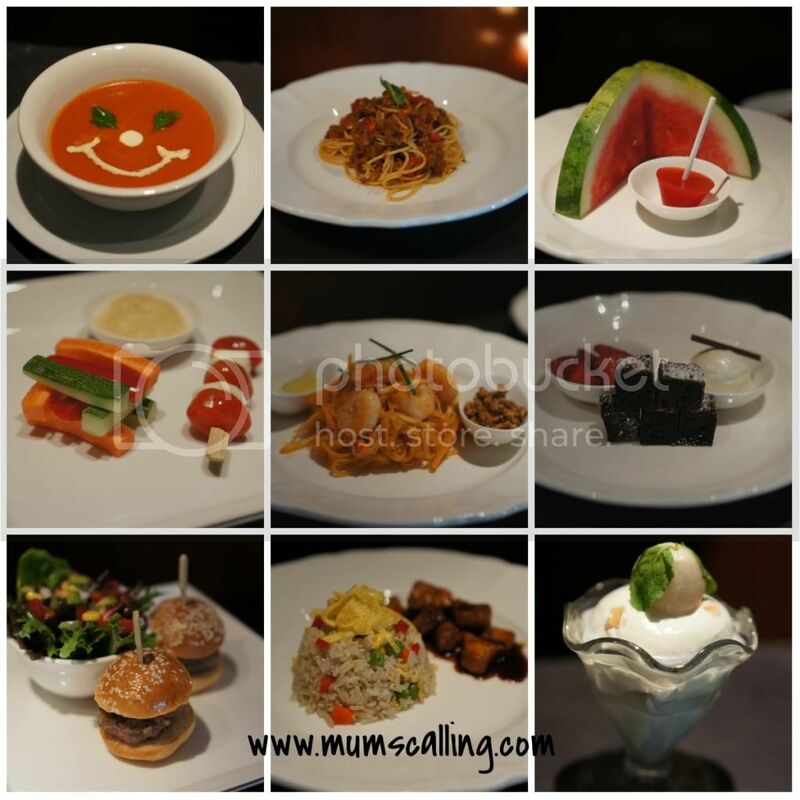 A very comprehensive menu, from small plates to desserts, specially designed for children. It was co-created by child food experts, Michelin-starred chef, Theo Randall, and nutritionist, Annabel Karmel. Oh yes, I read her books and love her recipes! It was our privilege to get the first taste of its menu on its launch party. 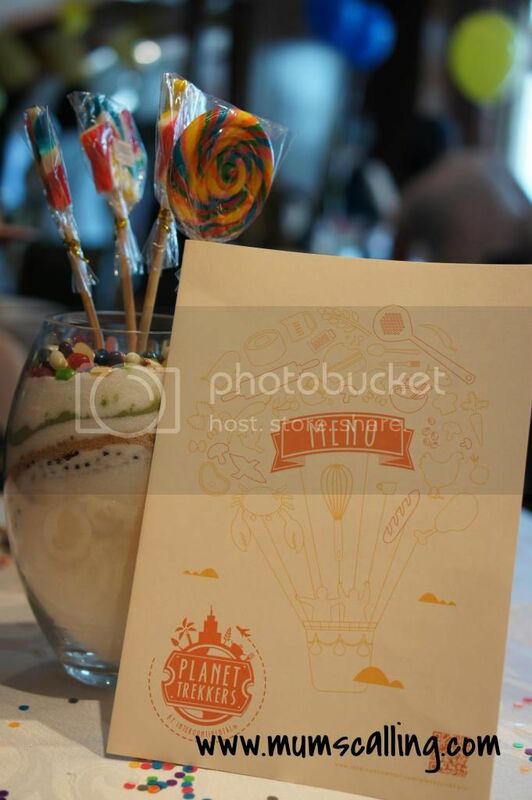 Where the kids were overwhelmingly entertained by balloonist, magician and of course, a well selected spread of dishes, from appetizers to desserts. Definitely the best children's menu we've ever seen and tasted. Delicious and nutritious, what more can parents ask for?!! The menu has a wide selection of food choices, from Asian to western. I'm assured that all little guests will find something they love. I don't mean to get you hungry, but they really are yummilicious as the pictures reveal. My personal favourite was, Everything! Ok, focus, the burger and pad thai were the more outstanding. I spoke to chef Randall that day. As a Mum, I was concern about processed food, so I asked about the beef patty between those burger buns. I'm glad they were made from scratch, with minced beef. We topped off our tastes with, the not to be missed, desserts! 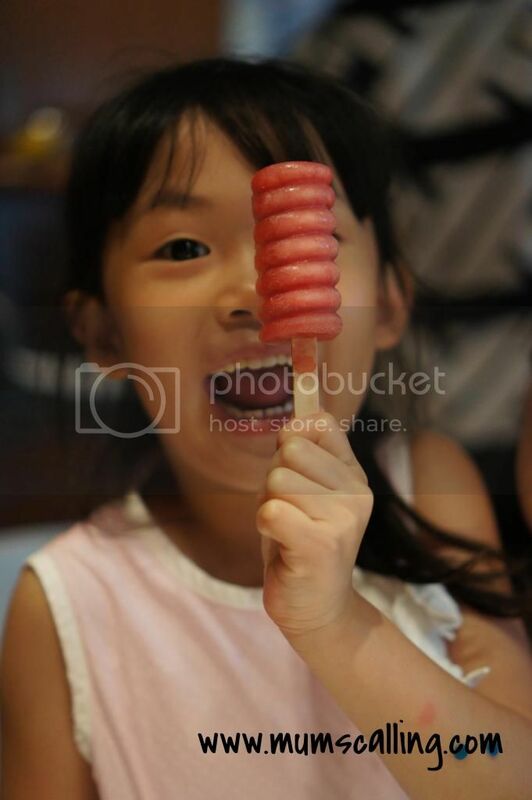 Watermelon popsicle was a hit for all big and little ones, and the Lychee frogrut is totally out of the World! I love! I would prefer giving the kids yoghurt over ice cream. 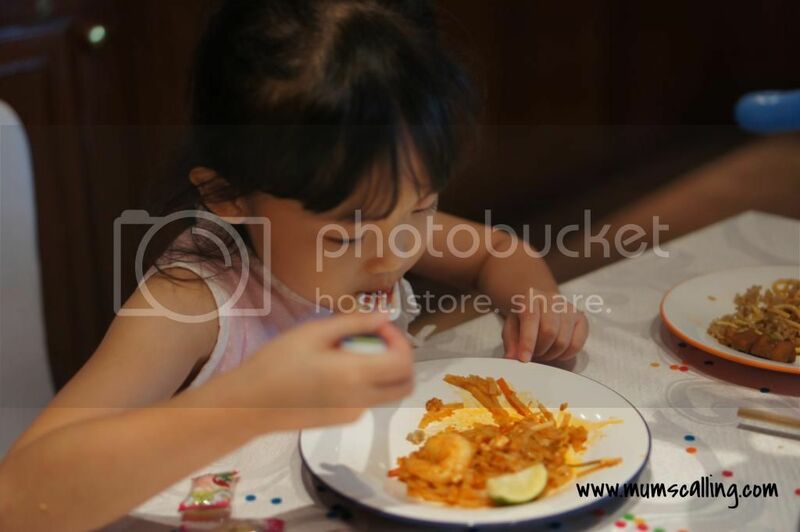 This whole new menu created for the little guests, is available at InterContenetal hotels and resorts throughout south east Asia, and available globally by end of this month. Another child friendly option for our travelling accommodation. How about something from the kids' menu, for room service? 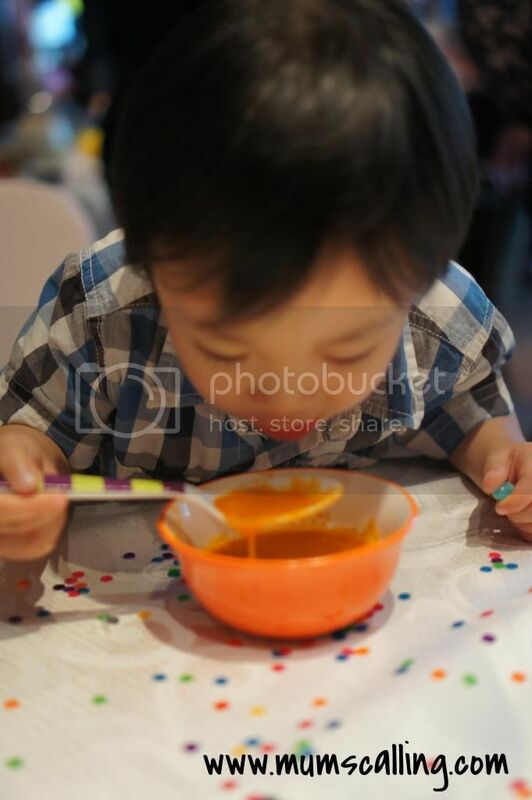 It was a great, yummy party created for all the wonderful little people! Disclaimer: We had the opportunity to attend this dinner party launch. All opinions and pictures are solely our own. We believe very much in values and character beyond academics. With a little idea about raising kids in relation to growing trees, and reaping good or bad fruits, I did a quick lesson on the good and bad apples we can reap from growing a kind and bad tree. 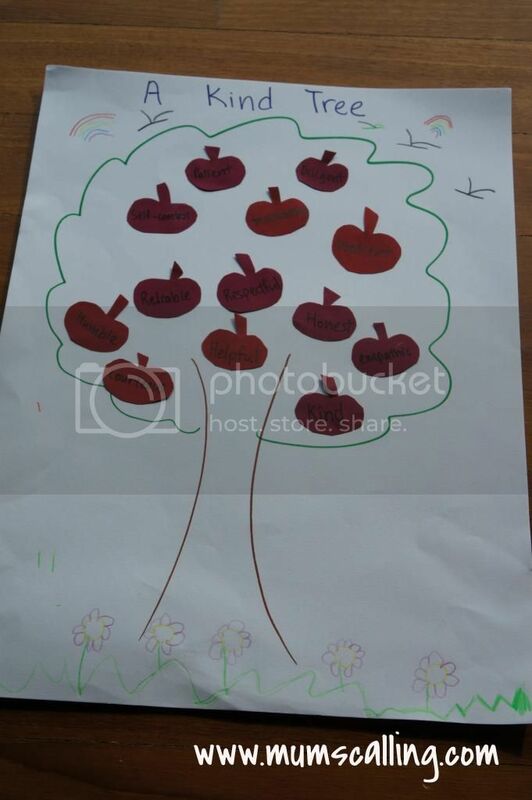 Had Js to sort and paste the apples into the respective tree. Kind tree bears juicy good fruits and bad tree bears bad fruits. As they go along, we talked about each word, and how we should or should not bring good and bad acts of out it. As well as, to always remember using kind and encouraging words. 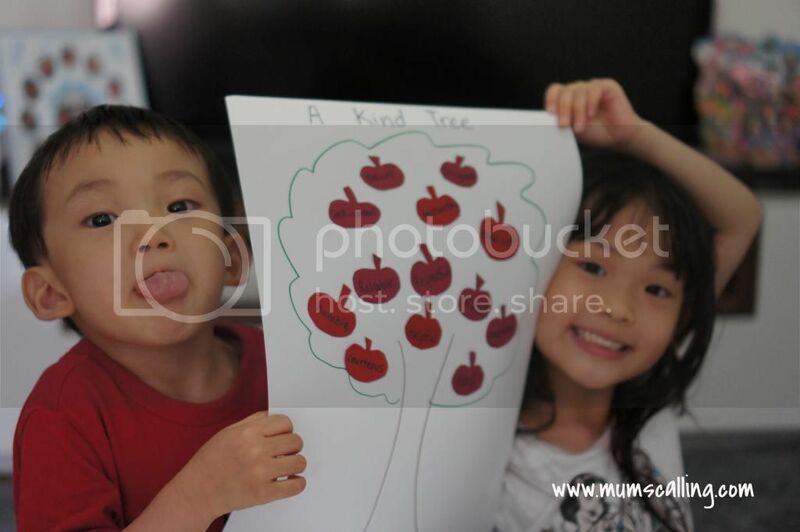 After they completed their tasks, they picked the tree that they want to be! The good kind tree. Phew! And I shared that a kind tree attracts beautiful things. Just like how a kind person attracts the wonderful things and people around him, looking great on the inward and outward! 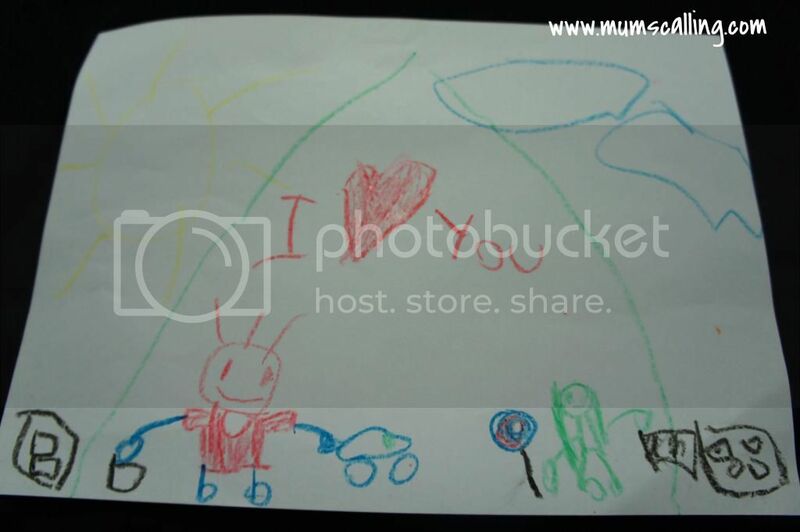 They then added rainbows, birds, flowers and grass to make up the beautiful things around that good kind tree. It became a beautiful garden. We had it up in their room as a reminder of the good values to practice and bad values to dump out. For the past 8 months, since our final months in the states till this day, I've been keeping the kids 24/7 with me. I withdrew them from school since November last year. So yes, I am homeschooling them! Jare should rightfully be in N1 and Jazz in K1. I get raised eyebrows and interrogated curious questions whenever I proclaim, the kids don't go to school. And it's not like they should be in the mainstream primary school, where schooling is compulsory. The common questions or comments I get these days, from family (yes, even my parents), relatives, friends and even strangers are, "Aren't they in school?" "K1? Gotta go school!" Or when we're out playing on a weekday, strangers would chat up "No school today?" So hmm, I'm not much of a small chat person or when I don't feel the need to bring anyone through my personal decision, I'll just brush questions off with very simple replies. After all, a Mum knows her battles best. She knows what's best for the family, to work or not to work, to homeschool or not. We don't need to shed much light on justifying ourselves. I don't think I'll be in a prolonged situation of homeschooling Js, sharing the load of bringing some bread and butter home is in my plan. Just that I'm caught in a situation of having little toddlers at home, childcare is our only option if I plan to work. Since I've not caught up with a job, it's only prudent that I keep them with me. While job hunt goes slow, I take my everyday opportunity to teach and guide Js. I may not have the professional resources to teach Js, but I don't think I'm in total lack of ideas. There are tons of books and ideas in the bookstores and even online resources to aid my teaching. Along these months, I witnessed the kids' milestones, know close to heart their academic, mental and physical progresses. Academics and character building have been our very zoomed in areas. Academics fill our weekday morning schedule. 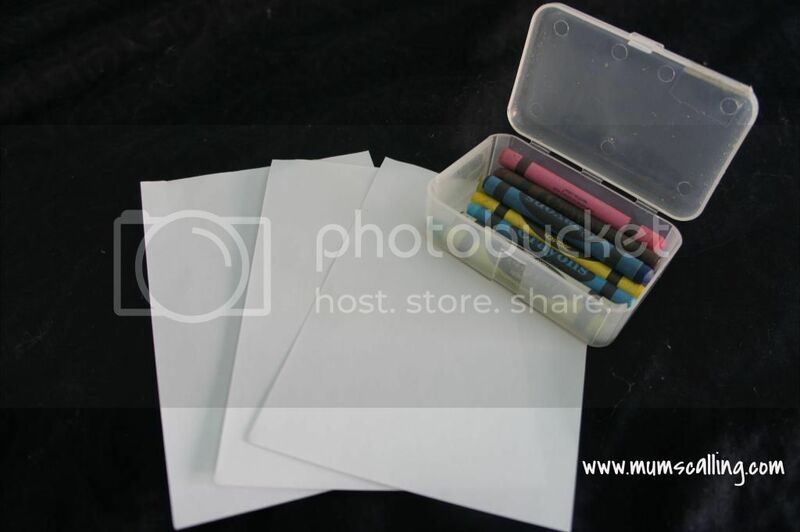 We work on assessment books, readings, experiments and sometimes arty crafts. In our afternoon time, Js are free to play, with some days on board games, crafts, TV or even back to academics. Challengingly, both Js decided to give up their nap some time last year. Leaving me a more comprehensive schedule with them. I am constantly in search of ideas to keep them occupied. No home work is done on our excursion days, where we bring learning and playing out of the home settings. I wouldn't know how well Js fair among their peers, but I know all about teaching and learning at their pace. I try not to get panicky when Js don't get the simple things right. It's my longest project ever to get Jare put on his clothes fuss free and almost perfectly. I understand they sometimes lack that effective learning in groups, or maybe an ineffective educator. We try our best to make learning fun and effective. After all, patient is one fine quality we can posses when it comes to successful teaching. I'm glad that I can tailor my teaching to their individual need and progress. Social skill isn't a total neglect. Js pick up social interactions when we hang around with our friends' kids. We love doing play dates! Whenever we're out playing with other kids, we observe how they respond during play. Do they wait or push for their turn? Do they apologize for faults? Do they play nice? I confess to having that tad worry about how they respond in social situations. Homeschool kids aren't short changed. It's lots of work hard and play hard too. Yes, lots of frustrations for us, but we make up with frequent hugs and kisses, any time of the day. The best part about being home with them and working away from home is, I can get my cuddles and kisses anytime of the day! A Mum plans her battles well, if she doesn't think homeschooling is her highly developed trait, she wouldn't. Preschools are readily available. 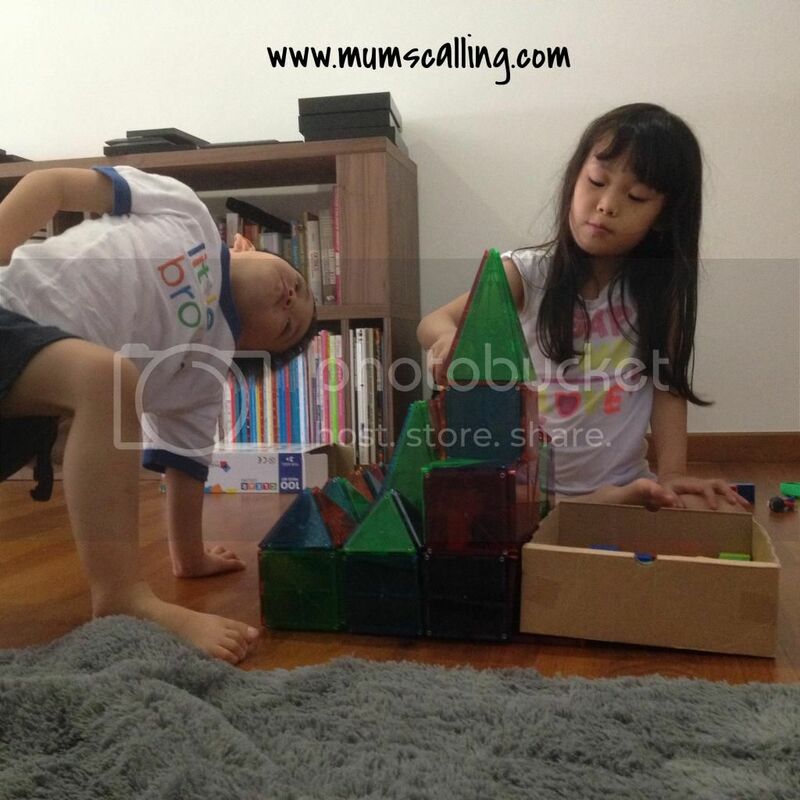 In our culture today, homeschooling mums are uncommon and it isn't an easy route to ride on. Homeschooling requires huge responsibility, I feel sorry for Js if they are stuck home with me everyday, playing aimlessly and doing nothing purposeful or fruitful. It's my Motherly duty that they are taught and engaged meaningfully. It's very much about discipline and consistency, though I have lazy days too. That's our completion! A little of a tiger mum. 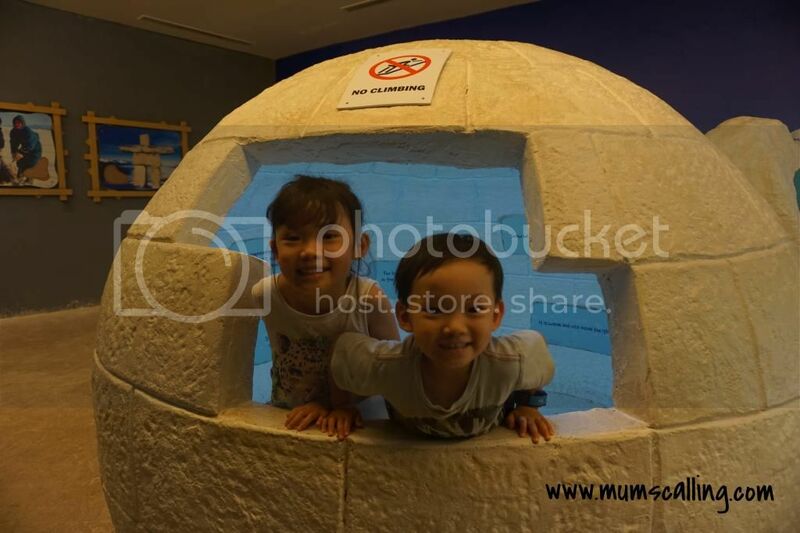 Stay at home Mums and homeschool mums may encompass different elements. 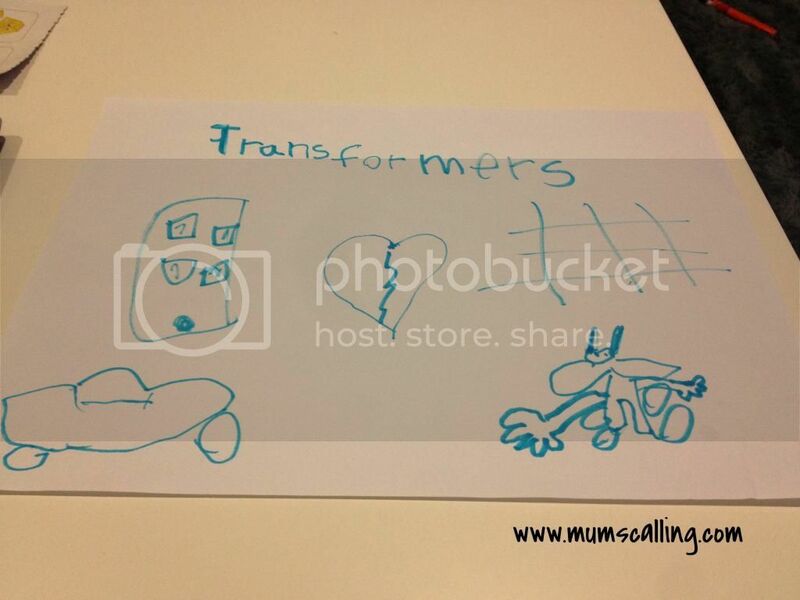 I can be a stay home mum, but I've school going children. Academic is outsourced. It's a different perspective being a SAHM, working in the homeschool department. Nope, we aren't weird, so are our kids. For now, I shoulder that 2 titles. Breathing in, breathing out... everyday is a surprise.